The first two releases 2018’s run of The Fourth Doctor Adventures have been engaging and at times emotional and thought-provoking dramas that could have been realised fairly easily on the small screen even with the classic series’s modest budget, but ‘The Mind Runners’ by John Dorney opens up a two-story epic taking place on a sprawling dystopian world rife with crime and suffering from limited resources that could never have realistically come to life on screen, instead making the most of the audio medium afforded it. When the Doctor, Leela, and K9 arrive in the vast city that covers the entire planet of Chaldera, they immediately find themselves in the centre of a spreading wave of death involving the planet’s Mind Runners, individuals who use technology to hop into the minds of strangers to see and feel whatever strangers see and feel, as the dark secret at the heart of this society grows in strength. With just a few brief lines, Dorney paints a sordid picture of this society in which resources and power are so limited that individuals have taken to joyriding in random peoples’ minds for a form of entertainment and temporary escape. Chaldera is on the verge of collapse, and a colossal rocket has been chosen as the best means of evacuation after the lead scientist in charge of teleportation experiments met his untimely demise when a test went awry. As the citizenry has been waiting for the time of evacuation to arrive, however, a spate of murders involving Mind Runners has brought the practice and its participants even more directly into question, and the newly-arrived TARDIS trio witnessing the latest death dampens the presumed theory from the investigating force that these are suicidal actions. Indeed, Leela’s knowledge of the looks of fear and of being chased intimates that there is another unseen force at play and provides enough reason for the trio to join Josette Simon’s strong-willed but ultimately open-minded Officer Tarenah on her investigation as they try to get her to open her eyes to the bigger picture around her that these deaths suggest exists. Intriguingly, joining and following the Mind Runners introduces the concept of the legendary Night Mind, a demonic consciousness so evil that it can turn anyone else who touches it mad as well. Given that the connections formed when Mind Running are supposed to be completely random, this legend when paired with the deaths brings with it the prospect of an external force exerting its malign influence or at the very least of a secret whose owner will go to any lengths to protect. As the Doctor and Leela split up to cover more ground and as the technology they took from the latest death site gains prominence from shadowy figures watching from afar, the Doctor’s discovery of the Digitals who believe that flesh is simply a vessel for the soul that can be disposed of and upgraded and Leela’s discovery that the teleportation scientist’s fate was not quite as final as initially believed as Tarenah abruptly meets her end at the hands of the mysterious Mr Shift allow ‘The Mind Runners’ to deftly introduce more of the many factions at play within Chalderan society without yet going into too much detail beyond what the public already knows through reported stories and gossip. 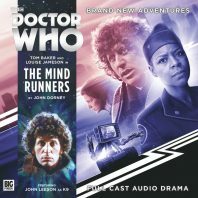 ‘The Mind Runners,’ of course, will be tied to its concluding half ‘The Demon Rises,’ but by itself it is a wonderful exercise in world-building that the expanded running time of the two-story format truly allows even if this means that the leads’ inevitable standout moments are withheld until later while this world breathes and develops naturally. Doctor Who does not often dive into the noir genre, but the dark mystery at the heart of this doomed society hoping to escape for survival is an intriguing ongoing thread that easily carries the characters and listeners through to the close of a story that toys with twists on many familiar elements.